eRodent > Cages and Toys >Bedding. 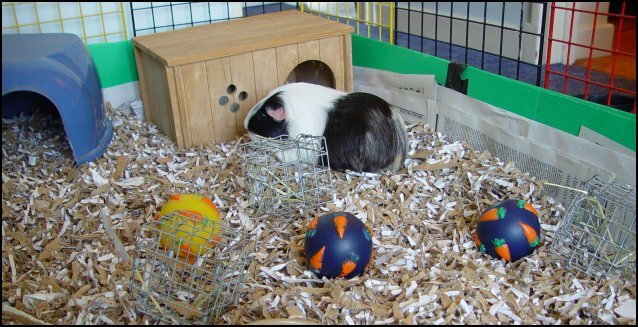 This page is about bedding suitable for guinea pigs, chinchillas, degus, jirds, gerbils (and probably rabbits and hamsters as well). One of the biggest problems that I have found is getting the right bedding for my rodents. I suffer with problems with dust and hay and I have found that some of the animals do as well. There are photos of the bedding in cages at the bottom of the page. Please let me know if you have any other alternatives or what you think of the bedding on this page. I am willing to try out different beddings but won't automatically put your bedding on this page and it may take a little while if I am busy at work. I have not included ordinary straw as I have not used it since one of my guinea pigs got a piece stuck in her eye years ago. An entry on this page isn't an endorsement for any of the suppliers, I have used most of them but take the usual caution when paying for deliveries. 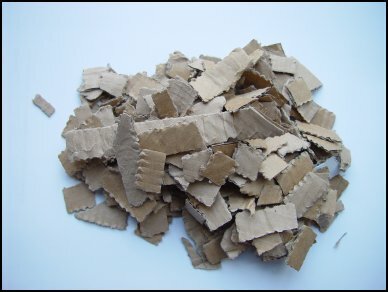 A number of suppliers make chopped corrugated cardboard which is very low dust. I put a good deep layer of it on top of the newspaper in the guinea pigs cage. They don't seem to mind and it is really very absorbent and the liquid goes through leaving the top dry avoiding "soggy bottom syndrome". All of our animals are now on this as it doesn't upset my allergies at all. 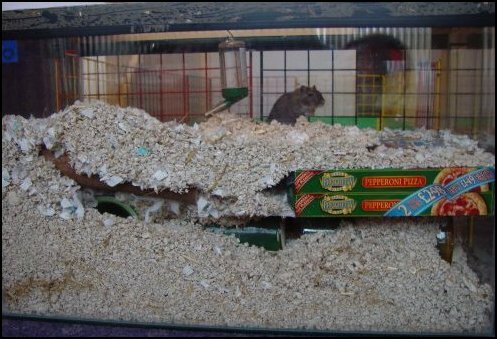 The Jirds and Gerbil rip it up and mix it with their bedding and can actually make tunnels in it if you add things like ceramic tubes and boxes to support it and it doesn't cause sore noses, unlike shavings. I buy mine as large (21kg) bales from Earthly Enterprises, who will deliver a single bale, but it's a lot cheaper if you pick it up. There are a number of other suppliers of similar products in different parts of the country - see here. Pros: Very low dust and allergy. Cheap in bulk. Cons: Not that burrowable. Not that easy to get hold of, bulk buys need to be stored. Dust Level: Very low - ideal for allergy sufferers. Pros: Very low dust and allergy. More burrowable than Ecobed. Cheap in bulk. Cons: Not that easy to get hold of, bulk buys need to be stored. The bedding that everyone recommends for small animals. It's very absorbent and keeps smells down really well but it is impossible to get in any kind of economy bulk size in the UK. 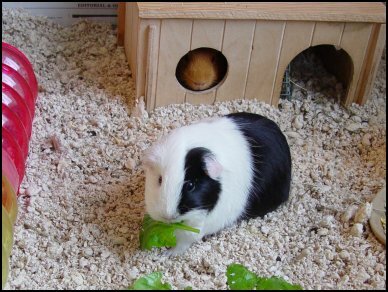 We used it for our guinea pigs until recently but had to mix it with other bedding to keep the cost down. It's become much easier to get hold of in recent years and is less expensive for the smaller cages of rats and degus. There are some reports of people having allergies to it although it is certainly less of a problem than hay/ straw or shavings. Pros: Lower dust and allergy. Very absorbent and keeps odours down really well. Cons: Expensive and difficult to source. Some people seem to get allergies to it. Megazorb is nicer than Carefresh and much cheaper if you can find a local supplier. It is low dust, absorbs smells well and is clean and pleasant to handle. 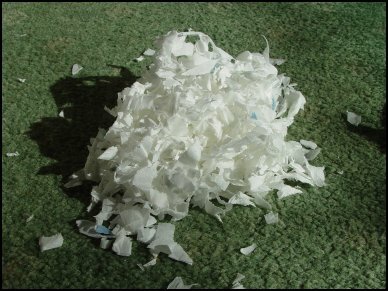 For Jirds and Gerbils, whilst it doesn't compact as well as shavings, with a few boxes and tubes it made a good burrowing medium (see bottom of page). It is very light and so when it collapses, they just dig themselves out. 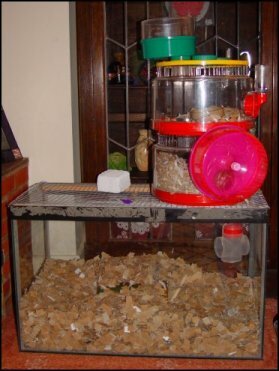 It worked very well for the Degus and Chinchillas and doesn't mess up their fur. It was very good for the guinea pigs (see picture at bottom of page). Unfortunately I developed an allergy to the dust after a few months, but I would still recommend it as it caused me less problems than shavings and the animals no problems at all. 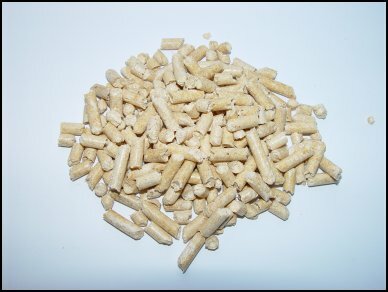 The web site is at Megazorb or phone around your local horse feed dealers as many are now stocking it. Pros: Low dust, pleasant smelling and absorbant. Cheap in bulk. Cons: Getting hold of it - comes in large sacks so you need somewhere to put it. Dust Level: Low - Lower than Carefresh. J&M Products have sent me a sample of their Snooze Flakes medical grade flaked paper for small animals. It is very soft, doesn't seem to have any dust and because it is flakes animals won't get tangled in it. They claim that the paper inhibits ammonia formation but I didn't have enough to trial. It's certainly looks worth a try if you are allergic to dust. I would be interested in hearing from anyone who has tried it. There are a number of sizes for sale and discounts for bulk so contact them via their site for a quote and more details. Pros: Non allergy, soft and comfortable, burrowable. Cons: Could get soggy - but I could be wrong because I haven't tried it with piggies. This the traditional rodent bedding. 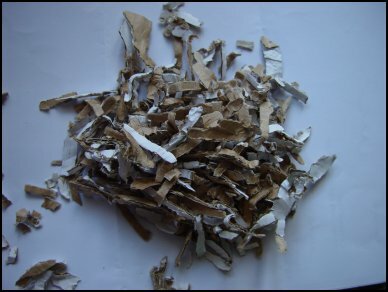 However, there seem to be studies that show that pine shavings are not good for the health of our rodents. They can cause breathing problems, sore noses and possibly even liver damage. I have had a lot of problems with gerbils getting very sore noses on shavings and at least one of my guinea pigs is violently allergic to them. They also set my asthma off. Some brands are definitely better than others so it's worth shopping around. 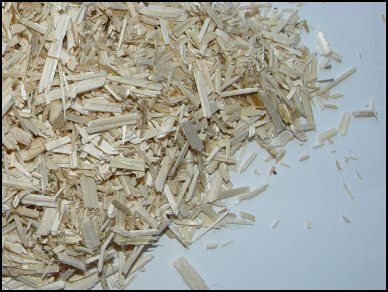 Pine shavings are traditionally used as a deep burrowing material for gerbils. Peat it is often recommended as another alternative although I found it to be a bit damp which might cause respiratory problems. 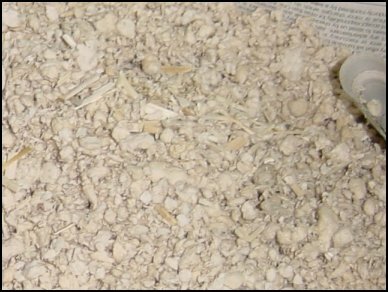 I think that the best bedding for burrowing rodents is probably Megazorb or Finacard/Ecobed with plenty of boxes and tubes. Pros: Cheap and Easily available. 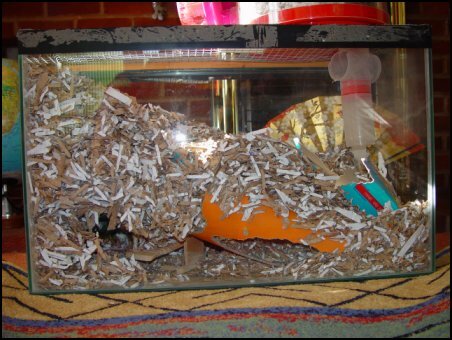 Nice burrowing medium for gerbils. Cons: Dusty, potentially harmfully, causes allergies in people and pets. Dust Level: Depends on the brand but medium-high. I used Russell Rabbit for a long time with my guinea pigs and degus. 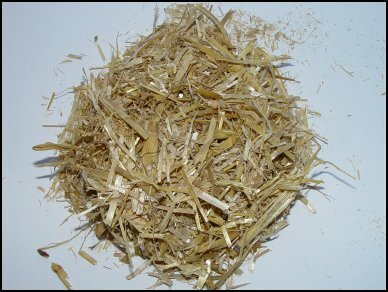 It is chopped straw that is nice and soft and doesn't cause injuries. 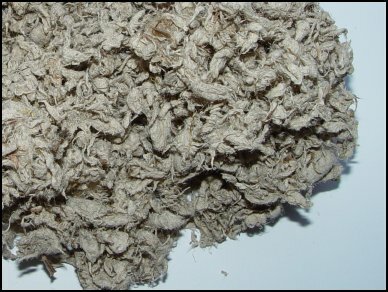 It does not absorb that well and gets smelly quite quickly but is reasonably cheap and easy to get hold of. The product also can vary quite a lot in quality between bags. Pros: Cheap, non-toxic. Very soft and quite good for guinea pigs. Can burrow, but not that well. Cons: Dusty, not good if you are allergic to hay. Need cleaning out a lot as not very absorbent. There are a number of beddings made from chopped hemp and even wood. 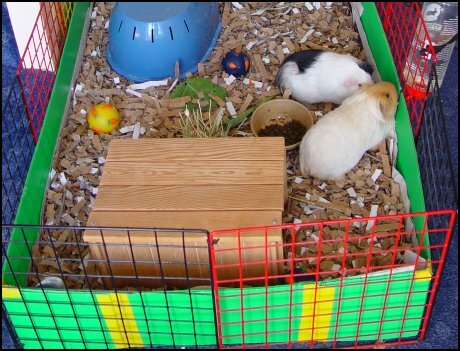 These may be suitable for larger animals but care needs to be taken with chinchillas and degus as they do tend to eat bedding and there is a risk that wood may splinter and lodge in their teeth. Slightly dusty but it doesn't have the allergy factor of shavings or hay. Pros: Low dust and allergy. Quite absorbent and non smelly. Cons: A bit rough on the little feet. Not that cheap or easy to get. Risk of chewing injuries. 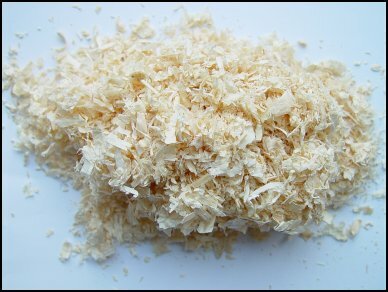 I have used this in the bottom of the chinchilla cage but since it is made out of compressed sawdust it still gives off phenols and is a bit hard on feet. Not something I would recommend for Chinchillas, Degus or Burrowers. It is, however, excellent for putting under the bedding in the corner of guinea pig cages to absorb the worst of the urine and for use under hay in litter trays for rabbits. Cons: Not burrowable, hard on feet - only suitable for surfaces that aren't walked on or under other bedding. A number of rabbit and guinea pig owners use VetBed for their animals as it allows water to pass through remaining dry on top.I haven't used it myself but I have been told that it works very well with the top staying dry even when they wee on it. Dust allergic piggies react well to it. It does have to be brushed off and washed every two to three days. Not suitable for chewers though as it might be risky if ingested. Pros: Non allergy, soft and comfortable. Cons: Obviously not burrowable, needs to be washed in washing machine. Rabbits and Guinea pigs only. Cons: Obviously not burrowable, needs to be washed in washing machine. Other sources of chopped cardboard bedding. Brown Stuff did sell 20kg bales of dust extracted chopped cardboard animal bedding in Denny, near Falkirk but I am unsure if they are still trading. Walmsley Premierbed make and sell card bedding and are based in Leeds (west Yorkshire). SafeTBed is a similar product to Ecobed based in Paington in Devon available in 20kg bales. BedXcel is also a similar product to Ecobed and is available widely in Scotland and in other parts of the country as well. Shreddibed - recycled cardboard horse bedding. The web link is not currently working though. Images of Bedding in Cages. Here are some photos of various beddings in the cages.These beddings will also work well in chinchilla and degu cages, which are generally less demanding on a bedding as they don't pee as much as guinea pigs or need to burrow. Gerbil in Finacard showing part of tunnel network.